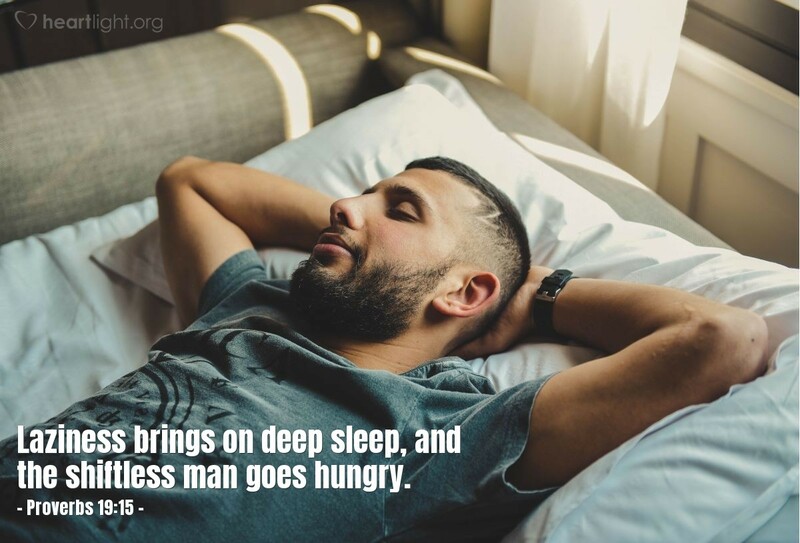 Laziness brings on deep sleep, and the shiftless man goes hungry. I was raised in a family with three boys. Dad had a theory: A certain amount of testosterone had to be burned off by each boy every day. If it weren't burned off daily, the house would quickly become unlivable. Dad didn't have to memorize Proverbs 19:15 — it was embedded in his DNA! Growing up, I didn't appreciate the importance of hard work. I knew they didn't call it "hard" by accident! I was content to be a lollygagger (in East Texan English, that's Solomon's ol' lazy, shiftless man). As I've grown older, I've found that working hard with my hands has many redeeming qualities and being a lollygagger has none! El Shaddai, God over all things, please teach me the balance between work and rest. Help me to balance both, so that I can bring you honor and display your gracious rule over my heart and my time. In the name of Jesus I ask this. Amen.